I never expected to be rumbling toward Little Sahara State Park on an ATV. I like cars, and I’ve been known to travel by golf cart, but motorcycles and other vehicles with hand throttles have never interested me, particularly fast-moving ones. My clumsiness, paired with high speeds, requires that I be enclosed in a steel infrastructure of some sort. So it was with surprise that I found myself volunteering Oklahoma Today publisher Joan Henderson and myself to drive these things from Stewart’s ATV & Buggy in Waynoka down the road to the park where our photo shoot for the Oklahoma Tourism & Recreation Department was taking place. Driving an ATV was not something I ever aspired to do. Then again, it was something I never had done, and that seemed like reason enough to try it. After a quick tutorial in the shop’s parking lot, we were off, hurtling down a sandy trail, bouncing over dips and drifts, leaving a granular haze in our wake. The chorus of Bon Jovi’s “Dead or Alive” went through my head. I like to think he penned that song after an epic dune buggy excursion. 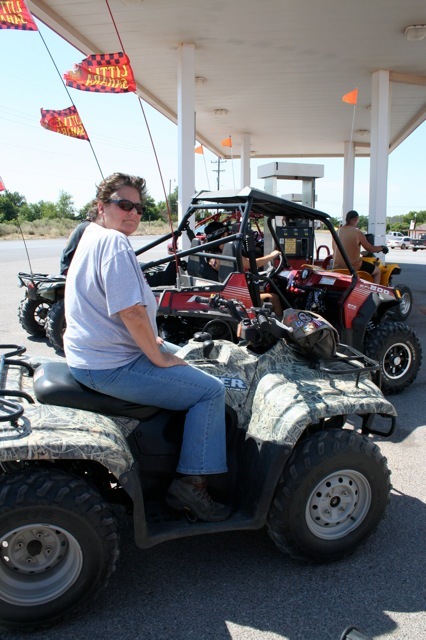 Oklahoma Today publisher Joan Henderson getting ready for an adventure at Little Sahara State Park. I can’t speak for Joan, but I didn’t find our voyage to be worthy of a song. Ten-minute commutes that end in parking lots rarely allow time for ballad-inspiring self-reflection, and this was no exception. We had succeeded in transporting the vehicles to the shoot site. Mission accomplished, experience achieved. Verdict: Not bad, but not really my thing. I prefer the leisurely pace of the golf cart. The people who were appearing in the photographs hopped on the vehicles and sped off into the dunes with photographer James Pratt and members of Stewart’s staff. Joan and I watched them disappear over the glistening horizon, leaving us in the deserted parking lot. One thing you can probably infer from Little Sahara’s name: It’s hot in July. Long, long ago, the Cimarron River flowed over the entire area, leaving deposits that have since eroded into the dunes you see today. It’s a huge regional draw for ATV and dirt bike enthusiasts, who come in droves during Oklahoma’s cooler months. Because of the generally oppressive heat, summer is the park’s quiet season. The riders that do come out tend to come at night. But when you’re trying to get all of Oklahoma’s state parks photographed before the end of the year, you’re forced to take the heat. And so we did. After a fatiguing jaunt to check out the new observation deck, we took shelter from the sun under a pavilion to await the return of our party. Shadows disappeared from the landscape. A huge beige spider studied us from a fence post as we chugged lemon-lime Gatorade. Streams of sweat gave way to rivers that felt cool against my hot, gritty skin. We chugged more Gatorade. The spider disappeared from his post. Leather-clad bikers seemingly immune to the 100-degree temperatures sped past, swirling dust through our feeble oasis. We spoke of lunch and the air conditioning to come. And then finally I heard them. The puttering grumble of little engines grew louder until our companions emerged from a brushy trail. I don’t know how long we sat there that day. It felt like hours, although I’m pretty sure it was actually more like one hour. James and the models, who didn’t appear to sweat, ventured on with admirable fortitude to take photos at another site, and Joan and I mounted the four-wheelers once again to drive back to the shop. After thanking Stewart’s staff for their generosity in providing us with vehicles for the shoot, Joan and I retreated to the comfort of an air-conditioned state minivan and made our way to the Hi-De-Ho Cafe in Watonga. Cheeseburgers, tater tots, and iced tea never felt more life sustaining. Once I was removed from it, the Little Sahara outing reminded me that uncomfortable experiences often are ultimately beneficial. Sure, we were hot and tired, but we also got to eat hamburgers, spend a day outside the confines of an office building, and visit western Oklahoma, with its hundreds of miles of rusty, glitter-flecked mesas and rolling, technicolor wheat fields. You never know what good thing is just over the next crest.